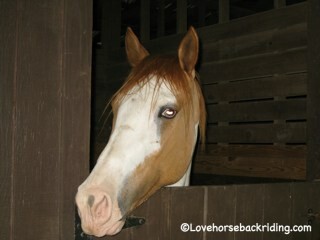 See a horse pic or five for the equine obsessed! Once you are bitten with the "bug" you can spend hours looking at pics of your own and everyone's horses! 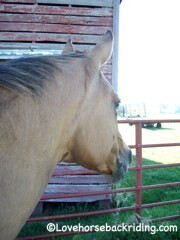 This beautiful pic is of an Appendix Quarter Horse gelding. 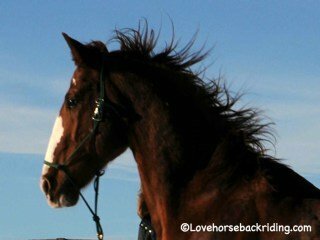 Isn't he handsome with his mane flying in the wind, the perfect blue sky and his ears pricked like that? Did you know that Appendix means that he is Quarter but has more Thoroughbred in his bloodlines? Now check out these suburban equine sweeties. As you can see they live in a neighborhood backyard that is zoned for horses. Not all horses are kept on large amounts of acreage. Places like this are common in the western part of the US. This pic is of my Appaloosa mare when she lived in Illinois. I love the intent look on her face. She was watching some kids play in a nearby backyard. The red barn behind her was built a long time ago and it adds to the rustic feel that comes with this picture. This is a paint gelding on a camping trip in South Carolina. He's such a curious sort always greeting every person and animal that comes by his stall. He is an excellent trail mount, seasoned traveler, level headed and willing to listen and respond his rider's cues. 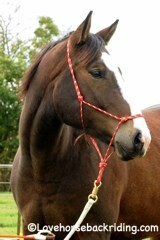 This last pic is a stunning bay gelding. He he pretty high spirited and his "mom" says he can be a bit of a trouble maker. Hmm, I think "Bandit" is a great fit for his name. Red is definitely a good color for him. Want More Tips, Training and Riding News? Subscribe to our Newsletter! I promise to use it only to send you Love Horseback Riding.